Did you know that on 01 April it will be exactly 13 weeks since New year’s Day? Time to dust off those resolutions, see how well – or not well – you have progressed, reset one’s goals and priorities and re-establish motivation towards achieving those goals. There are, as usual, many holidays looming during the month, so use the time to do this. Interestingly, in non-leap years, April always starts on the same day of the week as July and ends on the same day of the week as December. Fascinating. Its Autumn on the Highveld. The light is slightly different, the celtis leaves are dropping and all I want to do is eat chocolate eggs! In our unheated pool, we’ll probably be able to eke out one more week of swimming – thanks to the hot days that still prevail – but the reality of cooler, shorter days ahead draws closer. We have just taken delivery of a beautiful array of Velvets in various colours. Velvets are just the thing for winter – they immediately make a room cosier and snug whilst still looking elegant. And they are so versatile – they can be used as upholstery for furniture, for curtaining and for cushions. 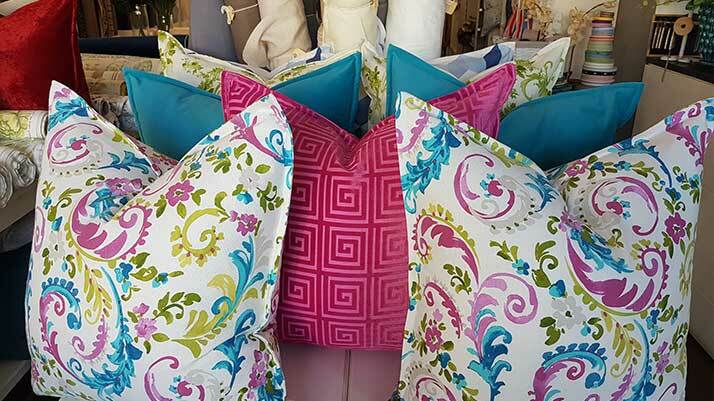 Speaking of cushions – our bespoke cushions continue to fly off the shelves. Come in and see what we have in stock, or let your creativity run wild and create your own. Have a wonderful month. April is like a mini holiday season so enjoy. And remember – don’t waste anything so precious as Autumn sunshine by staying inside the house!